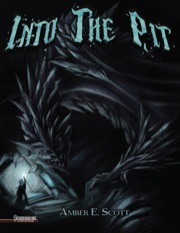 "Into The Pit" is a Pathfinder compatible adventure designed for four 7th-level PCs. By the end of the adventure, PCs should be midway between 7th and 8th level. The adventure centers around the exploration of a multi-level underground black salt mine called the Pit, but the adventure offers more than a straightforward dungeon crawl. The PCs’ initial patron is the Black Knight, king of Tara. Over the course of the adventure, though, the PCs may receive an offer from Na’Kriss, the salt drake who lairs within the mine, to serve his needs instead. 44 page adventure, including full color maps for both GMs and players (unmarked). This professionally developed adventure was part of the Black Diamond Games expansion Kickstarter. So excited to see this come more widely available!